My maternal grandmother had a way with her granddaughters. I was as young as six years old when she first showed me how to operate her treadle sewing machine and gave me free access to it and to the rag bag. Many were the sock dresses I crafted for a host of dolls. I was a little older when Grandma Anne gifted me with a yard or two of strawberry print fabric, and by ten years old I had completed my first lap quilt. I was following in the footsteps of my mother, grandmothers and great-grandmother (and who knows how many generations prior!) when I took up the art of quilting. I don't quilt much now, not since I realized that my favourite part of the process was choosing the fabric - beautiful fabric defines the term eye candy! But I believe that I am passionate about pursuing creativity today because I was given freedom and resources to pursue it as a child. Today, Grandma Anne is one of the very few remaining patchwork traditional quilters. 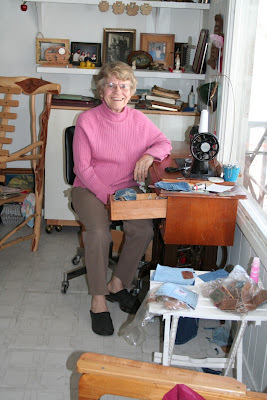 She still makes quilts on her antique Singer treadle sewing machine, and she concentrates on traditional patchwork patterns, such as the double wedding ring. Grandma doesn't know how to paper piece, or use a rotary cutter, and she rarely irons, as she doesn't own an electric iron. She and Grandpa live off the power grid in a rustic, solar powered cabin, and they were "environmentally friendly" long before the term existed! Once the piecing is completed, she quilts each quilt entirely by hand. Her enjoyment of her art (she despised the term "craft") is such that she completes a new quilt nearly every month. Grandma Anne doesn't have a market for her quilts - she makes them truly out of love and a driving creative force. She's happy to win $5 and a first place ribbon for them at the local country fair each fall. Each of her children and grandchildren have beds warmed by her handiwork, yet the quilts keep coming, and so last year she and I opened an Etsy shop just for her quilts. She can't compete with the so-called handmade quilts coming out of China or wherever, and in fact her prices in no way pay for her hours spent quilting. But if you care about the provenance of your heirlooms, and if you love handmade, check out Grandma's shop. I believe that we all have a seed of creativity that we can nurture and enjoy or ignore to our detriment. I am so thankful for the women in my family that modelled creativity to me and encouraged me to express myself. I haven't even mentioned the roll of newsprint that Grandma Anne always made available for her grandkids to draw on - nothing like creating a masterpiece twelve feet long!